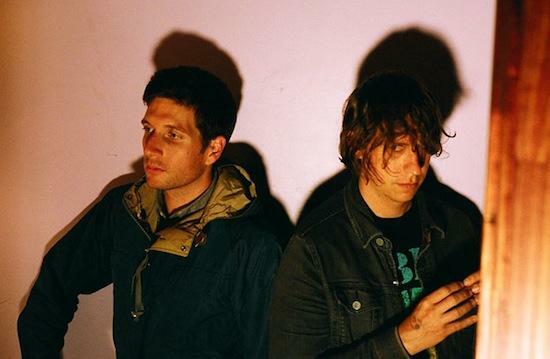 Nearly a decade in the business of constant touring and recording albums is an impressive achievement for any band, let alone a DIY punk band, but Los Angeles’ No Age have weathered the years tremendously. An Object, the band’s third for Sub Pop, is their first new material since 2010’s Everything In Between, and it’s both a logical progression and a complete deconstruction of their burning guitars, pop propulsion, and thick, fuzzy textures. Opener ‘No Ground’ is No Age stripped to their most elemental; Randy Randall’s one looping riff and Dean Spunt’s finger-pointin’ voice set the agenda for the band’s biggest shake up in eight years. Surrounded by redwood trees in Acata, California, Randall filled us in on starting from scratch and what “Do It Yourself” really means to him. An Object feels quite minimalist compared to your previous albums, with little drums and less of the feedback squall. What inspired the back-to-basics approach? Randy Randall: We started writing the way we’ve always started, just getting in the room and jamming, without any real conscious consideration for direction. But there became a sense that the ideas that we were playing off didn’t sound fresh, and we didn’t want to feel like we were writing a sequel. We are always trying to advance our band, evolve our songwriting. So it felt like a good idea to try something different. 'Be honest' was really the siren call for this record… just put out something that felt more honest, and not like a machine, not just a band that’s out there playing the gigs and festivals and writing another record to throw on the fire. We’ve become a bit more self conscious about that. One of the biggest inspirations sound and tone-wise was Psychic TV. They were the kind of a band you couldn’t really peg down. In the late 80s into the 90s they got a bit more dancey, electronic, but the early stuff, specifically the record Pagan Day, it’s a beautiful, varied, eclectic sounding album. A lot has been written about how you and Dean have assembled the entirety of the album packaging yourselves. No Age has always been quite hands on with the visual presentation of your records [alongside collaborator Brian Roettinger, the band was nominated for a Grammy for the packaging of Nouns], but what inspired this leap? RR: Being this involved with the package side of things is something that started not really out of desire but out of necessity. When we were starting out there was no budget, the packaging was just whatever you could make. We are DIY by necessity. It’s not kitsch or anything. Dean should really be getting the credit for this, because it was his idea, but the more we talked about it eventually I was like “okay, I’m all for it” and in the end it felt very satisfying. It sounded crazy at first, but we folded 5,000 CDs and 5,000 LPs. Did the deep involvement with the physical production of the album change your relationship to the songs in any way? RR: It feels like you own it, in a very physical literal way. We’re such fans of music, the ephemera of music and all the trappings of it, so we care about how things are printed, how vinyl is pressed. It might sound a little fetishistic to say we worship these pieces [of music], but for us to just throw something out there without much thought kinda feels like a slap in the face. But we do make music for ourselves first. We write the songs that we want to hear, create the album that we’d want to buy. We figure if we wouldn’t buy it, why would anybody else? Was the desire to physically take over the production of an album a reaction in any way to the streaming/download culture? How does it feel that the most likely way people will hear An Object is Spotify or downloads? RR: There’s maybe an element of that, but it really comes down to whatever makes us happy. It was for us, about the process of making something. We thought a lot about production and what it really means to make a record when you have a label… we were really in our own heads, reflecting on where we were at. Every record we try to find a different door. A new hallway, like “oh where does this go?” and this time it was about examining, in a kind of absurdist way, the physicality of creation. But I’d rather someone hear it that not hear it at all. We are an unusual band, I can’t say we’re pop friendly, radio kind of band, so it’s not going to be the thing that everyone’s going to want to buy. Wherever there’s an opportunity for people to find it, through streaming or downloads, it’s a totally viable, credible way of hearing it, if the only other option is to not hear it at all. Because I grew up in the small suburban world where there was no way to hear all the cool stuff, so I would just listen to the radio, read all the magazines, watch all the music videos - all my childhood was really influenced by those mass media outlets, which now all just means “online”. And with that you get these amazing, thought-out, critical blogs, which are just zines times a thousand. With zines, you’d get excited because there’s only like five issues, and it would be a lot of work and maybe only a handful of friends got them, which there’s obviously something great and precious about, but there also is about creating a blog that can introduce you to all this new stuff on a daily basis. It’s the same idea, just transferred. All the record shops in my hometown have closed now, so the internet really is the only way to get access to the mass media and the underground here. RR: Of course those two things are not unrelated, because the mom and pop record stores did really get hurt by the ability to go online and find anything, but I don’t think it’s practical or helpful to bemoan that fact. I mean I really enjoy those mom and pop record stores, I grew up going to those, seeking a record out, buying it and enjoying the hell out of it, but it’s the internet and the free access to information that’s worth remembering. Music has always been the sharing of collective ideas and stories around the campfire. They even put a price on that, the record “industry”, building an industry on a young girl’s dreams. Think of Elvis Presley, personifying an adolescent’s first sexual dream for a profit, and now it’s just Justin Bieber. He’s always existed, somewhere in your nightmares. An Object is out this week via Sub Pop. No Age tour the UK in October, see below for dates.